Shark cupcakes, in honour of this upcoming Shark week! Originally made for a special little girls birthday. 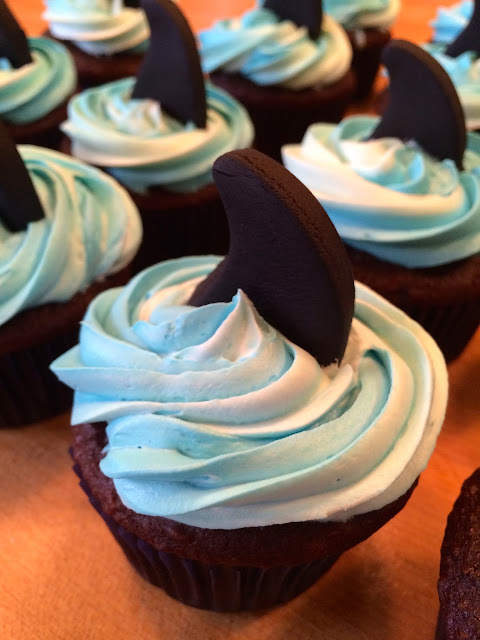 What you need to make these is black fondant, cupcakes, a moustache cookies cutter, two tubs of prepared frosting, icing sugar, blue food colours, 3 piping bags. 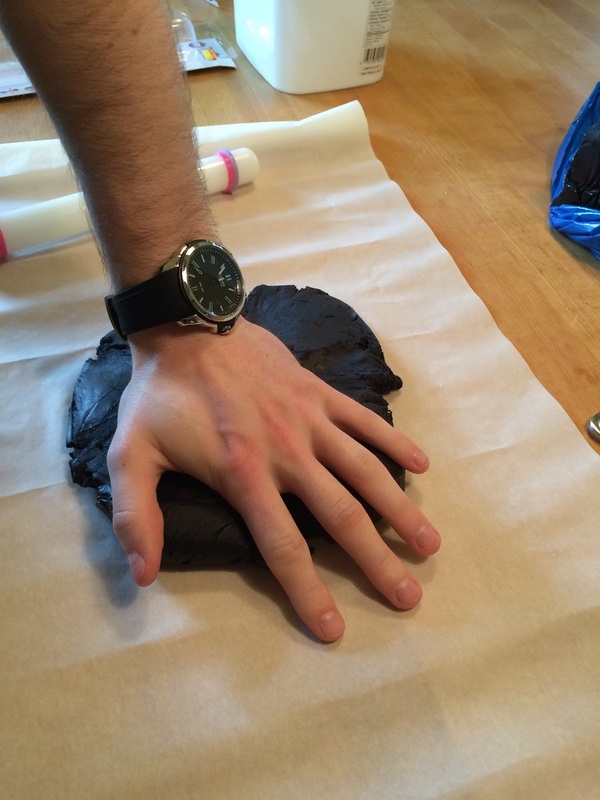 Start out by flattening the fondant, and then roll it out until is is about 1/4 of an inch - 1/8 of an inch thick. Once is is flattened and smooth, use the cookie cutter to cut out the fin shapes. As you can see in the picture below, you only need to use part of the moustache. 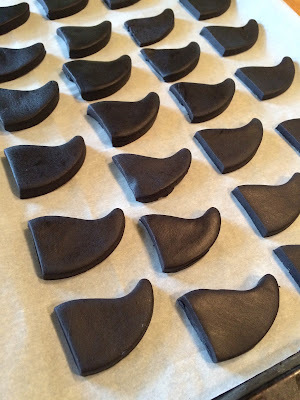 Place the shark fins on parchment paper to harden. 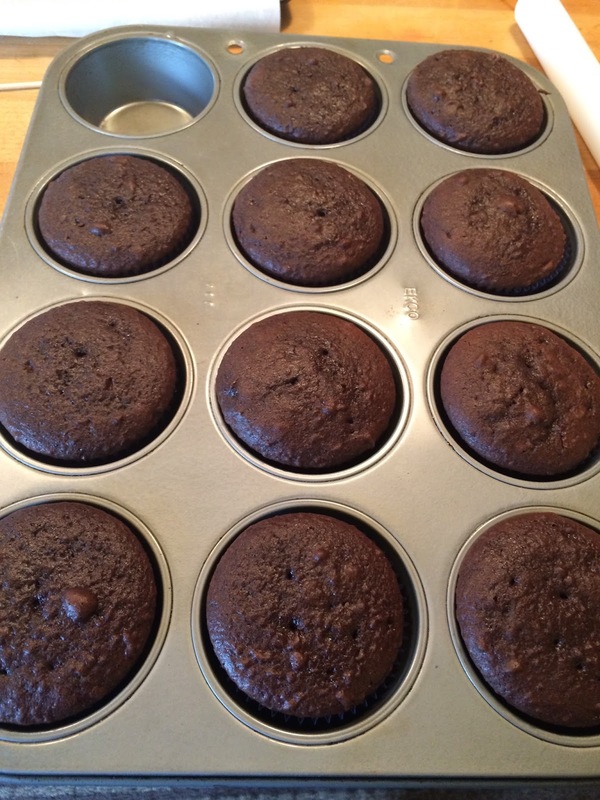 Next, have your cupcakes ready for icing. Empty one tub of icing in one bowl, and the other tub in another bowl. Add one cup of icing sugar into each bowl, and use an electric mixer to beat it in. 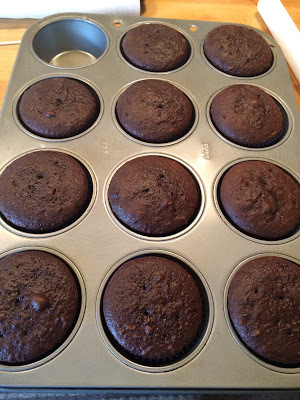 Keep adding little by little until the frosting is a buttercream consistency. Next, add in blue icing. You want a light blue and a medium blue. 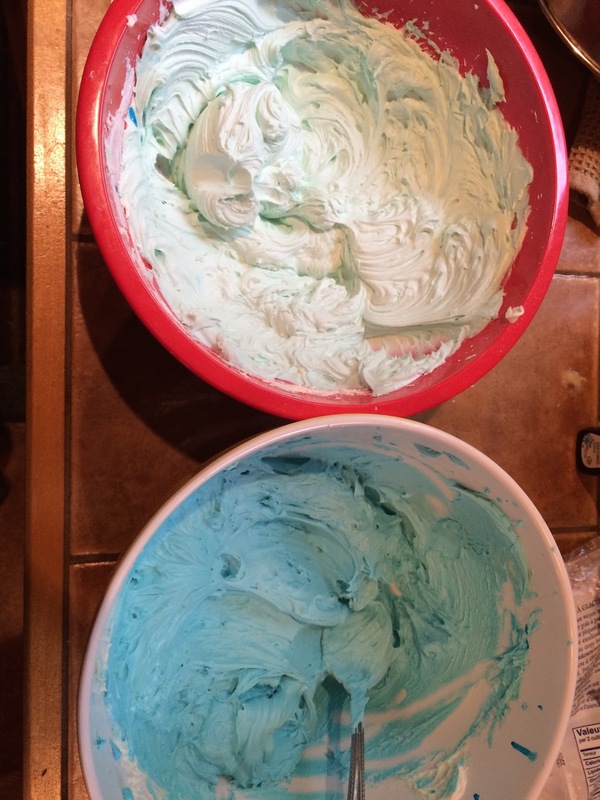 If you do two different colours, it gives more of a water look to the icing. 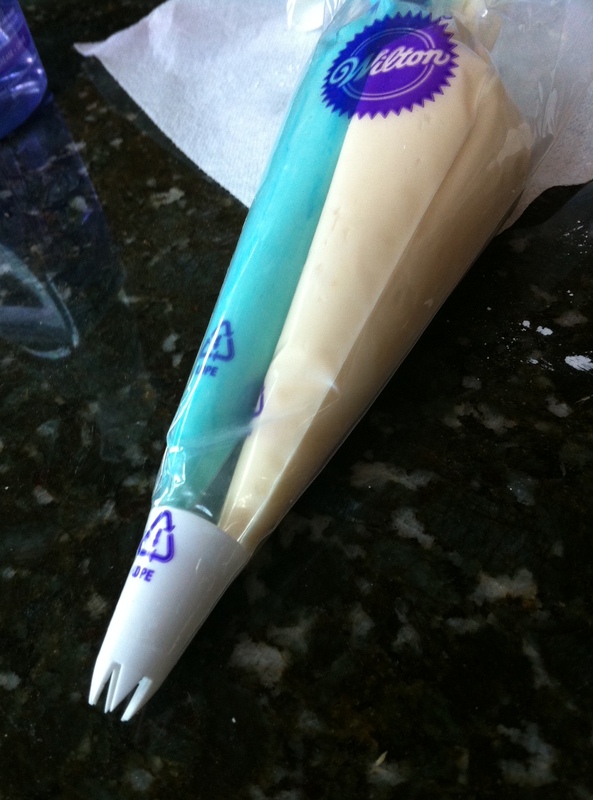 Put one colour of icing in one icing bag, the other in another icing bag, then in the third bag, put the icing tip, and put both filled bags (with cut tips) into the third bag with the icing tip in it. 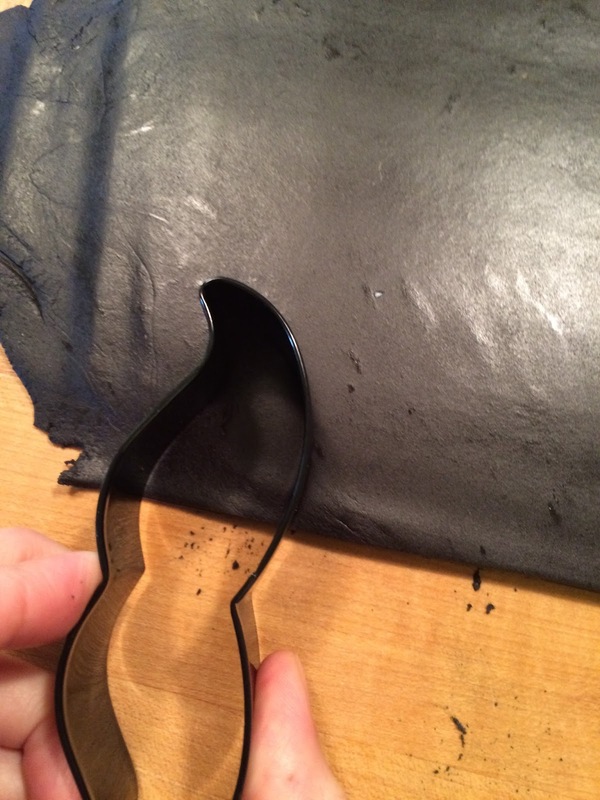 I didn't take a picture of this step, but thankfully the internet had a picture (Thanks Hannah Bakes!). Pipe the icing onto the cupcakes. Finally, stick in the shark fins!